Cognitive Bias Modification (CBM) can yield clinically relevant results. Only few studies have directly manipulated memory bias, which is prominent in depression. In a new approach to CBM, we sought to simulate or oppose ruminative processes by training the retrieval of negative or positive words. Participants studied positive and negative word pairs (Swahili cues with Dutch translations). In the positive and negative conditions, each of the three study trials was followed by a cued-recall test of training-congruent translations; a no-practice condition merely studied the pairs. Recall of the translations was tested after the training and after 1 week. Both recall tests revealed evidence of training-congruent bias and bias was associated with emotional autobiographical memory. 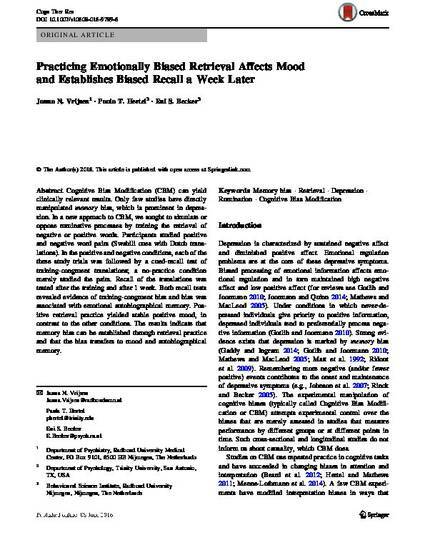 Positive retrieval practice yielded stable positive mood, in contrast to the other conditions. The results indicate that memory bias can be established through retrieval practice and that the bias transfers to mood and autobiographical memory.